The home is the most convenient place to charge. But many are not allowed to charge at home and therefore don&apos;t even get an electric car. This applies not just to apartment or condominium dwellers, but anyone else who cannot control their parking space. Typical house owners can hire an electrician, run permits with the city, etc, and install a charging station at their home. Others must plead with a landlord or home owners association, who might not agree with the request. You may be asking how to get an electric car charging station at your apartment complex. Or whether it&apos;s safe to run an extension cord from your apartment to your assigned parking space. Or whether it&apos;s allowed to charge your electric car using that power outlet in the wall of your carport. Desperation can drive us crazy, or as they say necessity is the mother of invention. The phrase "multi-unit dwelling" is technical jargon referring to apartment buildings or condominiums. Basically it means multiple housing units in a building. In a multi-unit dwelling, the property management decides between which investment pays off. Installing a charging station can shut up that pesky tenant, but will it pay for itself? And is there any risk like an electrical fire? Since apartment dwellers move frequently, how likely is the landlord to recoup the few thousand dollars to buy and install a charging station? Why should the tenant pay for equipment only to leave it behind? What if the tenant suddenly needs to move in a few months? Government planners hope to solve this problem by making it so more multi-unit dwellings have charging stations. Several laws have been passed or are being considered, in some cases to require wiring for EV charging, or to make it easier for EV charging support to be installed. The vast majority of multi-unit dwellings were built long before anyone thought we&apos;d be charging electric vehicles at home. We&apos;re talking about a massive widespread problem that exists in practically every apartment or condominium building. Every multi-unit dwelling occupant has as much right to drive an electric car as anybody else. The EV driver who cannot charge at home are at a disadvantage over other EV drivers. Understandably a person in that situation might give up and keep driving on gasoline. This problem is holding back electric car adoption, especially in areas with a high percentage of multi-unit dwelling occupants. In some analyses it is possible to build fast charging stations near apartment buildings. With a 350 kiloWatt fast charging station the 5-10 minute recharge time can make it seem like a gasoline station. But such stations are expensive to install, and the electricity cost is through the roof compared to what someone pays at home to their electric utility. The 6 kiloWatt level 2 charging infrastructure is far cheaper to install, and can easily support folks with even 100 mile commutes. Even 1-2 kiloWatt level 1 charging infrastructure is useful for most folks, and is incredibly cheap to install. This situation is all too common. The car is parked under a carport, it&apos;s impossible (forbidden) to run an extension cord to use electricity from inside the apartment. Because it would require digging a trench installing electrical service in the carport would be incredibly expensive. parking next to the apartment is forbidden because it is a fire lane. The utility meter for the apartment is way on the other side of the building. 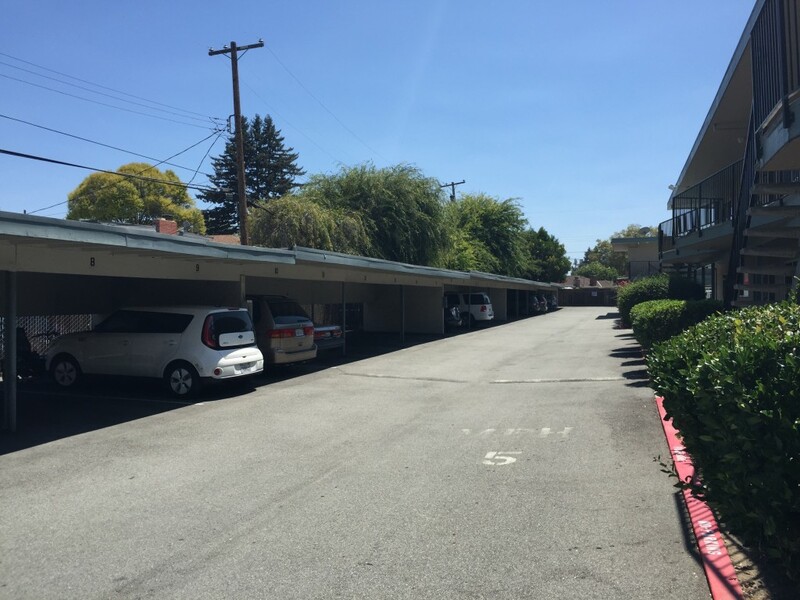 Parking at the typical apartment complex was designed with no thought tenants would use electricity in their carport space. But today&apos;s cars need electricity at our parking space, which is difficult to do in many cases. Getting electricity in the carport is a simple electrical/contracting job. But who will pay for it? And how to ensure the electricity is charged back to the tenant? The "house power" (electricity paid by the landlord for common areas) is overhead landlords are leery of paying. A few apartment complexes have installed a few paid charging stations in a corner of the parking area. While that&apos;s better than no charging at all, the apartment dweller is unable to reap the monetary benefit of charging at home because of the fee required to use the charging station. In actuality, it is far from impossible to own an electric car while living in an apartment building where the landlord forbids charging an electric car at home. Life is more difficult, but it is not impossible. One key is to rely on fast charging infrastructure, but that&apos;s getting ahead of ourselves. What&apos;s the practical thing an individual can do? Carefully examine your situation: Try to understand where the electricity runs, and the expense required to add charging service. It&apos;s helpful to understand it from the position of the landlord/HOA. Very few complexes are set up so an extension cord can easily to their parking place. We discussed using charging cords elsewhere, and need to say again that it&apos;s extremely important to use a thick extension cord to reduce electrical fire risk. If you do use an extension cord, your charge rate will be limited to the line cord charger. If the extension cord needs to run across a sidewalk, make sure to mitigate the tripping risk. whether it puts anybody (or the building) at risk. Educate yourself on government policies: The government may be ahead of you, and may have passed laws designed to help apartment dwellers get charging. California has a couple laws on the books. Look for complexes with charging service: Some landlords have seen the light and have installed charging service. Usually this will incur an extra fee similar to using a public station. This seems to be limited to the higher priced complexes, unfortunately. Talk with the landlord or HOA: These people need to know that their customer base is interested in charging at home. The more people ask, the more landlords are aware of the need, the more likely they&apos;ll see this as a cost of doing business rather than a government mandate. The landlord receives a powerful message when a potential renter walks away because they don&apos;t offer charging. Some landlords are open to supporting charging, while others are closed to it. Some multi-unit dwellers have successfully implemented charging at home. EV Charging in Multi-Residential Buildings: One Success Story This man lives in a Condominium, and therefore "owns" his apartment, and has a deeded parking space. That fact made it easier, since he can control what&apos;s located at his parking space. The HOA was amenable to working out a deal. The install required installing a "submeter", to gather usage data on a dedicated circuit, then running wiring and conduit to a junction box where he installed a charging station. Every month he reads the submeter, then writes a check to the HOA. Cottage w/ outdoor power outlet For a few months I lived in a duplex/cottage where the landlord was agreeable to run an extension cord from an interior power outlet. I installed an in-line GFCI protection doohickey to prevent problems. The electricity was therefore charged on my utility bill, and everything was fine. Landlord agreeable to use house power At one large apartment complex where we considered getting an apartment, there were a large number of 120 volt power outlets all through the underground parking area. During the initial interview to see about renting an apartment, we asked about charging and the property manager said he&apos;d already spoken with one tenant about this and worked it out. Tenants were allowed to use the house power outlets to charge their cars. Using an extension cord while mitigating tripping hazard At another large apartment complex, we asked the property manager during the initial interview. In that case the parking was immediately in front of the apartment. Hence an extension cord was practical, with the only consideration that it had to run across the sidewalk. With a promise that the extension cord would be covered by a rug, the property manager agreed to the plan. Suppose you&apos;re stubborn enough to want an electric car even though you live in an apartment or condominium complex. An inability to work out an arrangement to charge at home, doesn&apos;t mean you&apos;re screwed. It means you must rely on public charging stations, and you don&apos;t get to enjoy the various luxuries of charging at home. Use the a charging station map, like PlugShare (see Smart-phone apps for finding electric car charging station networks), to find charging stations near the apartment. Look for charging stations near a restaurant you like, or near a grocery store, or near other places where you would spend time doing useful things. If your charging period is filled with an activity you&apos;d normally do -- like working out at the gym -- then the time to charge does not matter. The difficulty with public charging comes when you are simply waiting, and waiting, and waiting, for the dang car to charge, and have nothing else to do. The way to avoid that pain is to not do that pattern, and to instead ensure to do useful activities while the car is charging. It&apos;s best to not resent the car just because it needs to be charged. The charging rate at a fast charging station is enough that the half hour or so to recharge is not overly burdensome. It suggests an electric car ownership model similar to what gasoline car owners do. They can&apos;t recharge at home either, and therefore must take time from their lives to find gasoline stations offering a fast refueling experience. An electric car owner could rely on public fast charging stations just like gasoline car owners rely on gas stations. CONSIDERATION: The recharge time at a fast charging station (30 minutes to an hour) is still longer than refilling a gas tank. CONSIDERATION: Fast charging sessions are pricey compared to charging at home. You&apos;ll lose the economic benefit of electric cars. CONSIDERATION: There&apos;s a worry that frequent fast charging will hasten battery pack degradation. While that was true for the early model Nissan Leaf&apos;s, it&apos;s not clear this is true for all electric car models. These recommendations aren&apos;t just theory - it&apos;s the story I lived for two years. I&apos;m on my second electric car, and lived for 2 years in a complex (see the picture above) where the landlord did not allow me to charge at home. I&apos;ve examined the situation every way I can. Most affordable apartment complexes are simply not set up to easily bring electricity to the parking stalls. While it&apos;s not difficult to get electricity to the parking stall, the cost would be prohibitive. Over the past couple years I&apos;ve examined dozens of apartment complexes, and have talked with many landlords about charging at home. Most said "no" but it was clear they knew of the problem, and home charging was on their mind. Some were supportive, but the electrical infrastructure worked against us. Others were accommodating, willing to allow an extension cord across the sidewalk, or willing to allow use of a power outlet in the parking garage. Many people in this situation want to just drag an extension cord to their parking space. Unfortunately the typical parking spot is far from the apartment, making an extension cord a hazardous choice. An extension cord running across a sidewalk is a tripping hazard, and the landlord would rightfully get upset. Maybe you&apos;re lucky and there&apos;s a safe route that doesn&apos;t create a tripping hazard. Hopefully you read the recommendation to use an extension cord with heavy-duty 10 gauge wiring, and know how to do it safely. If you do it guerrilla style - run the extension cord so it doesn&apos;t create a tripping hazard - use a heavy duty extension cord - ensure it has GFCI protection - don&apos;t just plug into the landlord&apos;s power outlet without permission. All those steps will show seriousity and sensibility, and if the landlord does discover your guerrilla charging setup they may appreciate that you took measures to do so safely. My personal solution? I&apos;m now paying a bit more to rent a house. The 120 volt outdoors power outlet is way better than having no charging at home, and is sufficient to cover my needs. The extra cost is a hard burden to bear, unfortunately. But, wait, what about that power outlet in the parking area? It&apos;s electricity and it&apos;s right there, and you might think it&apos;s free, but you&apos;d be "stealing" electricity from the landlord who will rightfully get upset. It&apos;s possible to talk with the landlord and discuss the situation. It helps to do so with confidence, and to knowledgably express how it can be done safely. The fact is that electric car sales are increasing rapidly. Sooner or later the landlords will begin to commonly see tenants asking for charging at home, even if that&apos;s not occurring today. But expect the landlord to be resistant to allowing you to charge at home.